Preheat the oven to 350°F. 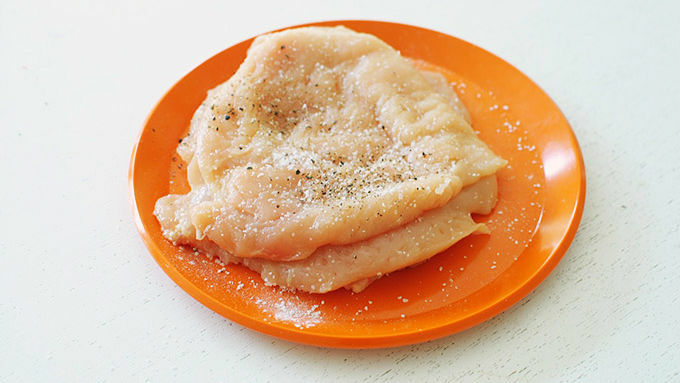 Place chicken breasts between sheets of plastic wrap and pound each out until thin. Set aside. In a food processor, combine the arugula, basil, garlic, Parmesan cheese, and a pinch of salt and pepper. With the motor running, add the oil in a thin stream until you get a pesto consistency. Evenly dollop the pesto in the center of each chicken breast, evenly sprinkle with cheese, and roll the chicken up, pushing the sides in to keep the filling inside. 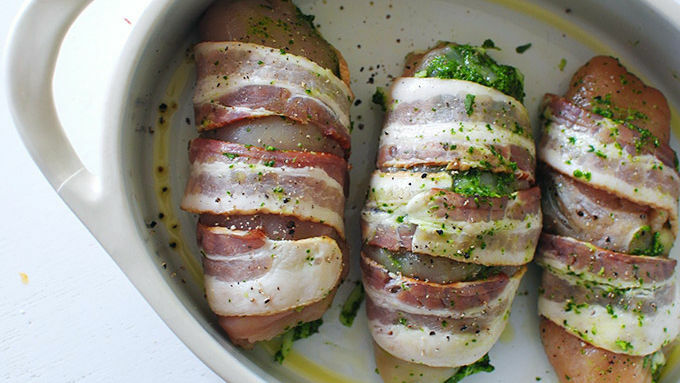 Wrap two slices of bacon around each chicken roll and place in a lightly greased baking dish. Bake for 45 minutes to 75 minutes, checking to make sure your chicken is golden brown and the bacon is crispy. Serve immediately. 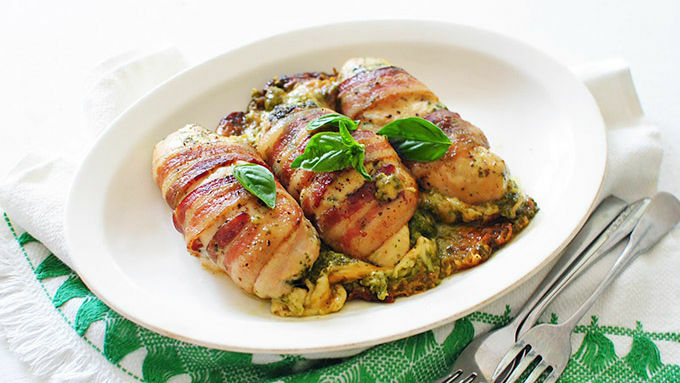 There's so much cheese in these Cheesy Bacon-Wrapped Chicken Breasts, you'll flip. I'd sort of consider this dish a classic. 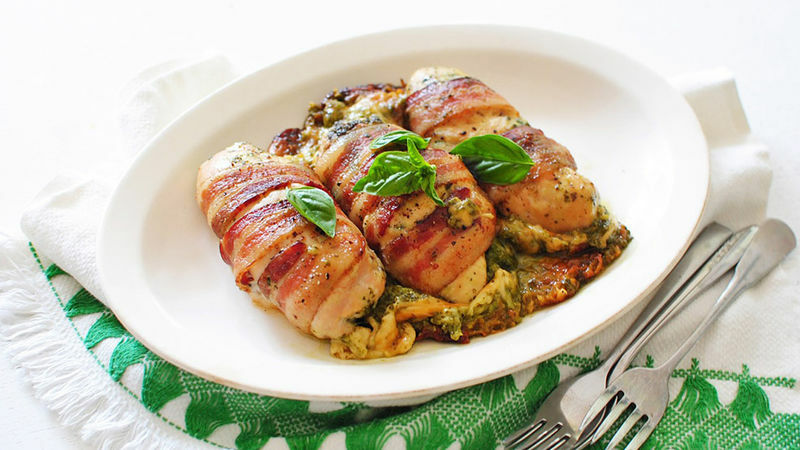 Chicken stuffed with mega amounts of cheese, rolled up and sealed with bacon strips, then baked until crispy, golden glory. But this time, I added something. Something green. Something with more cheese in it. 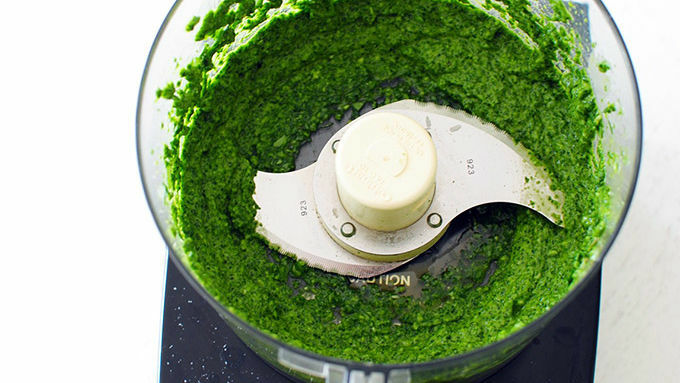 Arugula pesto! I included about a cup of basil, lending itself to a traditional pesto flavor. But I'm telling you, that peppery arugula pesto all blended inside chicken breasts in the oven? Goodness freaking gracious. And there's no point going into detail about the bacon, or else we may all faint. Just remember, the more cheese you add, the more will ooze out of the chicken. This is a very good thing. Dinner was AMAZING. 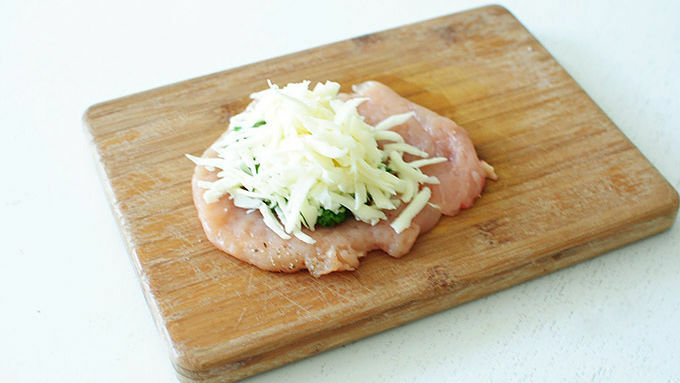 The cheese and pesto will melt out of the chicken creating this almost sauce-like mix around the chicken. Scoop it out. Serve it. Eat it!